Heat is the most common form of energy utilized within the various operations found in modern industry. Steam remains one of the most efficient ways of generating and distributing heat within industrial and commercial facilities. However, with the advent of carbon taxes, climate change, and the steady reduction of the planet’s fossil fuel supplies, the mass production of steam continues to increase in cost as time goes by. At the moment, there are no effective alternatives when it comes to mass producing the energy generated by steam. Hence, industries whose operations depend on steam must ensure that their systems are in the best operational condition possible. This measure ensures that all of the fuel used to generate steam, and the steam itself, are put to good use. To guarantee efficiency, condensate and air must be removed from these systems with high-quality Spirax Sarco steam traps. One method that so far has only been explored by select industrial companies is having specialists manage their systems for them. While it may seem costly initially, operators of industrial and commercial steam powered systems can benefit quickly from such expertise. “Whatever business they’re in, another thing that steam system users tend to have in common is that steam is not their core area of expertise. 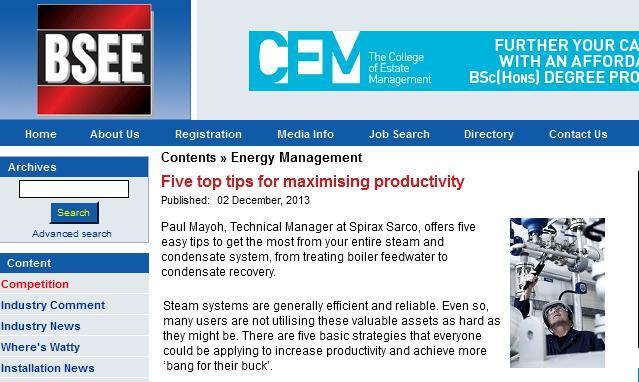 And with the much-discussed skills gap affecting many organizations, and in-house estates and maintenance personnel facing increasing demands on their time, calling in specialists to provide service and support for the steam system can be the most realistic, cost effective way of keeping things running at their optimum. By having their systems periodically serviced by reliable providers, industrial facilities can focus more on operation or production without having to worry about the escalating costs of their steam use. Many experts consider it best if the system manufacturer takes charge of managing the contract itself. Efficient Sarco steam traps, pumps, and other steam system components are best managed by the manufacturers of the system. This of course would only be possible if the chosen system and its parts are all authentic and sourced from certified suppliers like A.L.B. Industrial Supplies Inc. Legitimate parts make overall system management easier, as any problems will be easier to identify, with quality concerns at a minimum.